"I cannot, nor, consequently, want to try to give a definition, even a simple one, to what I paint. If I did try, I would risk very much closing myself in a definition that would later become like a prison for me." 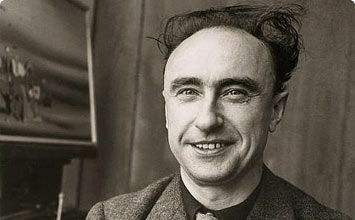 Yves Tanguy was in many respects the quintessential Surrealist. A sociable eccentric who ate spiders as a party trick, and a close friend of Andre Breton, Tanguy was best-known for his misshapen rocks and molten surfaces that lent definition to the Surrealist aesthetic. Self-taught but enormously skilled, Tanguy painted a hyper-real world with exacting precision. His landscapes, a high-octane blend of fact and fiction, captured the attention of important artists and thinkers from Salvador Dalí to Mark Rothko who admitted their debt to the older artist. And even Carl Gustav Jung used a canvas by Tanguy to illustrate his theory of the collective unconscious. Tanguy's symbolism is personal, reflecting his obsession with childhood memory, dreams, hallucinations and psychotic episodes. It defies explicit interpretation, and evokes a range of associations that engage the viewer's imagination and emotions. Tanguy's landscapes strike a balance between realism and fantasy. Naturalistically-depicted objects hover in midair, or drift toward the sky. Masterful manipulations of scale and perspective, and keen observations of the natural world contribute to the hallucinatory effect of his scenes. His bizarre rock formations were most likely inspired by the terrain of Brittany, where his mother lived. Like other Surrealists, Tanguy was preoccupied with dreams and the unconscious. What set him apart was the naturalistic precision with which he depicted the mind and its contents. This was his key contribution. More vividly than any artist before him, Tanguy imagined and depicted the unconscious as a place. Tanguy was born into a maritime family. His father was a sea captain and the family lived at the Ministere de la Marine in the Place de La Concorde. The seas, skies and stones of the the Finistère coasts in Brittany, where Tanguy spent his summers as a child, appear in his mature work. His early life dealt him some hard blows - his father died in 1908 and his brother died in the First World War. His mother moved to Locronan, Finistère, but Tanguy stayed in Paris to complete his education. As a teenager, Tanguy was lucky enough to make friends with Pierre Matisse (son of Henri Matisse) whose encouragement and support would be crucial to his artistic career, which did not begin immediately. His family expected him to join the Merchant Navy and so he did, working on cargo boats between South America and Africa from 1918-1919. 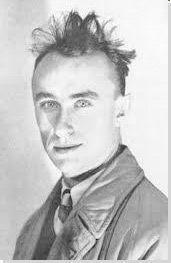 In 1920 he was conscripted into the French Army in Tunis, where he met the poet Jacques Prévert who delighted in Tanguy's eccentricity and strange habits - from chewing his socks to eating live spiders. The latter became a party trick that he would often repeat. The vast space, wan palette, and unearthly light in this picture evoke a post-apocalyptic wasteland. Airborne objects cast dark shadows, echoing the work of the earlier Surrealist Giorgio de Chirico. The cactus-like shape tethered to a geometric spider-web, and floating near the horizon, seems neither captive nor fully free. Typical of the relationship between words and images in Surrealism, the title complicates rather than clarifies the meaning of the work. With Breton (who, as a war medic, had used Sigmund Freud's methods to treat psychologically damaged soldiers) Tanguy combed psychiatric case studies of patients whose statements could be used as ideas for pictures and titles. According to Tanguy, Mama, Papa is Wounded! was among them. Various interpretations of this picture have been suggested. For example, that it references the violence of World War I and expressed the mood of heightened anxiety that followed. Or that the standing yellow figure may represent a father, the cactus a mother, and the amorphous mass a child. The work remains enigmatic, however, refusing to reveal its secrets, and reflecting the intentional ambiguity of Surrealist symbolism. This painting's fascinating provenance illustrates the reciprocal interplay between surrealism and psychoanalysis. Carl Jung, Freud's protégé and an important influence on the Surrealists, purchased this work in 1929, when Tanguy was almost unknown. Jung kept it in his study, where it influenced (and maybe even helped inspire) his theory of the collective unconscious in 1958. Against total darkness, four biomorphic forms surround a central cobweb shape and seem to levitate, casting shadows. Are these animals? Smoke? Fungi? Plastic? The faint horizontal bands stretching across the canvas create an ambiguous nocturnal atmosphere Tanguy's genius, perfectly summed up by Jung, was a "minimum of intelligibility with a maximum of abstraction." Jung interpreted the picture as an unconscious collective fantasy of the technological age, showing it to as many people as possible to test their interpretations. They saw bombs, distant planets, underwater creatures and cities lit up at night. Jung saw in the artist's bleak horizons a "cosmic inhumanness and infinite desolation" that triggered the viewer's unconscious. He concluded that the picture was an archetypal sign of the heavens, linking it to recent extraterrestrial phenomena. The feeling of empty stillness this work provokes was observed by Paul Eluard, in his poem, dedicated to Tanguy, with the following words: "From the ends of the earth to the twilight of today/Nothing can withstand my desolate images". From the bowls collecting water to the anthropomorphic shadow cast by the form beside it, a jumble of conflicting shapes confronts the viewer, vying for our attention. Dreams and realities merge in objects such as a pedal, a propeller, and a clamp. These are three-dimensional objects about to topple to the ground. Tanguy's intention is to express, not to communicate - to trigger sensations, not to explain. Tanguy relied upon his subconscious to supply him with ideas for paintings: "the painting develops before my eyes, unfolding its surprises as it progresses." What is reality and what is shadow? For Freud, the heightened anxiety created by his use of depaysement (the state of disorientation experienced in dreams) was a form of psychosis, delusions and illusions. For Tanguy, it was a source of power. Surrealists celebrated madness as both an inspiration and liberation, as Breton said in dreams you could: "kill, fly faster, love to your heart's content." In 1950 the Psychological Institute of Vienna displayed Tanguy's paintings beside those of schizophrenic patients to see if the public could distinguish between the two. They could not (a result that delighted the Surrealists). Breton believed that one day Tanguy's images "will be made clear with a language which is not yet understood but which people are soon going to read, which they are going to talk, and which they are going to perceive is best adapted to the new changes." Rock-like forms and a strange tower of balloon-shapes, wheel-spokes and stones inhabit this overcast dreamscape. The objects are solid, yet the composite form seems to be in transition. Is it molten or frozen? The palette of fiery reds and icy greys makes it impossible to tell. Joined in the illogic of the unconscious, these imposing forms cast shadows, imparting further mystery. There must be a sun behind them. It is possible that these forms were inspired by the Surrealist technique of Coulage - sculpture generated by pouring molten metal into water, generating amorphous blobs that evoked associations, somewhat like a Rorschach test. With one foot in fantasy, and one in reality, Tanguy, according to Andre Breton, "condensed ... a few pure elements of matter, meeting together and glowing suddenly like particles of dust dancing in a sunbeam." This otherworldly environment and its unknowable subject reflects a general interest among the Surrealists in mystery, ambiguity and transformation. For the Surrealists, the individual self and the external world are in a constant state of flux. In this late canvas, a tower of hard architecture, built from clusters of sharp, spiky objects dominates a steely gray and purple sky. The ground is covered with forbidding rubble (in 1955, the MOMA exhibition called a 'breathless congestion of boulders, pebbles and bones'). The interplay among these elements (the looming tower, threatening sky, and low heaps of pebbles) is forbidding, bordering on the apocalyptic, and the stuff of nightmares rather than dreams. Reminiscent of bombed-out cities (war was never far from Tanguy's mind) these bleak aerial views are typical of the artist's late period. These often include sharper, non-organic and apparently mechanical elements, piling up and stabbing into vast skies (as found in works like From Pale Hands to Weary Skies (1950) and The Hunted Sky (1951)). After the bomb tests and the horror of Hiroshima, Tanguy, a sensitive observer, continued to evolve in relation to his environment and other artists. The impact of his wife Sage's larger, geometric forms is visible here, as is the vastness of the American landscape. Tanguy's admiration for the work of the younger American artist, Frederick Sommer, who photographed bones in the desert, is also visible here. One further influence, no doubt, is also present: in the garden at Sedona, Tanguy's friend Ernst had built a vast metal and cement sculpture named Capricorn. The tower here is reminiscent of this monumental sculpture sitting under the bleak open skies. Tanguy completed this large work in the months before his death - while working eight to nine hours a day in deep concentration. It is a familiar subject, one that the artist revisited in canvas after canvas since the 1920s: a dreamscape under a storm-threatened sky. Here, however, there are no towers, sculptural forms or airborne objects. Nothing rises above the horizon. Everything is tumbled and broken. Towers have crumbled into the ground. The broken tower, as Tanguy well knew, is a powerful sign, an archetypal sign of castration and death in psychoanalytic terms. Whereas Mama, Papa is Wounded! evokes a jarring claustrophobia inside a vast, empty space, this is essentially the reverse: isolation, amidst a crowd. The artist's posthumous retrospective at the Museum of Modern Art in 1955 positioned this work as the culmination of Tanguy's work. While the title's reference is, like all Tanguy's titles, intentionally obscure, arcs were an iconic Surrealist symbol, a symbolic bridge between the invisible and the visible, fantasy and reality, sleeping and waking.